personally, the merry holiday feelings do not begin until my family and i pick a christmas tree. in this sentence i effectively used diction; from the use of the word 'pick', we can extrapolate that izzy selectively chooses her trees, meaning that she rejects all other trees until she finds the perfect one. we once again witness the human condition to strive for perfection, even if that means hurting the feelings of poor trees in the process. BAM. english analysis studying done. QED. oh look, geometry studying done, too. this week is crammed with before-break tests, quizzes, and assessments– too many? never... but it's overwhelming at times. during my study sessions and work periods, i enjoy listening to covers of classic holiday songs and ballads to keep reminding myself that the winter break is near. as i was saying before i went into my tree analysis, today we drove upstate to select the perfect arboreal figure. now in the Rael family, there's a lot that goes into consideration when choosing a tree: its height, its color, its fullness, its ability to fit in the stairwell, its scent, and other beneficial factors. we ended up deciding on a full, 11-foot tree with green pine needles and a blue-grey underside, while also having an extremely prominent pine-y smell. i say it's perfect. truly perfect. it's pretty bare at the moment, but it will be filled with ornaments by tomorrow morning. p.s. below is the playlist that i listen to during the holidays. enjoy. p.p.s. happy last consecutive date of the century. what a murky weekend it's been here in new york city. besides the wind chills and constant drizzle, it's been a pretty good one. my mom and i celebrated this ominous weather by baking espresso chocolate cake and fig & walnut biscotti. yes. that's right. TWO baked desserts. we're still making our way through the (best-ever) chocolate cake before it goes bad. which will be easy. since this blog is still in it's inception, this post is the first of its kind. moodboards. colors, inspiration, lovely things, and basically anything that catches my eye when i scroll through my pinterest and/or tumblr feed. this moodboard is inspired by this northeast sprinkle storm. dark + natural tones, indoor baking, and fresh spring flowers, and of course, sweaters. and the somewhat mellow weather. besides this moodboard, i'd like to introduce you to someone who i've been following for a while. valentina, also known as tuna (boon), has become an instagram sensation. other than being the only thing that my LA friends talk about, man, can she sing. this girl has so much talent, it's un-explainable. even though i do not know her personally, she seems like such a flawless character, and it would be pretty amazing if i met her the next time i visited los angeles. which will be soon, i hope. please listen to one of her soundcloud posts, it's very lovely. good morning from new york! it's been such a great weekend… baking… indoors… while the sun is out and it's the first time in months where the temperature has actually peaked 50 degrees. yup, i know, BAKING IS TOTALLY WORTH IT. the feels, people! the FEELS! this salad might give me superpowers. it's awesome and i need to try it. i might have finally found a recipe for the super-duper-good coconut curry cashews that i found at the chelsea market a few weeks ago! my favorite song for this week is seriously amazing, and you should listen to it…. i don't think it can get better than these babies right here. INSTANT BAKING. yeah, that's right. throwing some of my html skills at you. here we are. with these fantabulous cookies. i mean just YOU and these cookies. because once you eat them you'll be tempted to eat them ALL. but that's okay. *whispers* because they're healthy. *continues whispering* and they're flourless. and vegan. 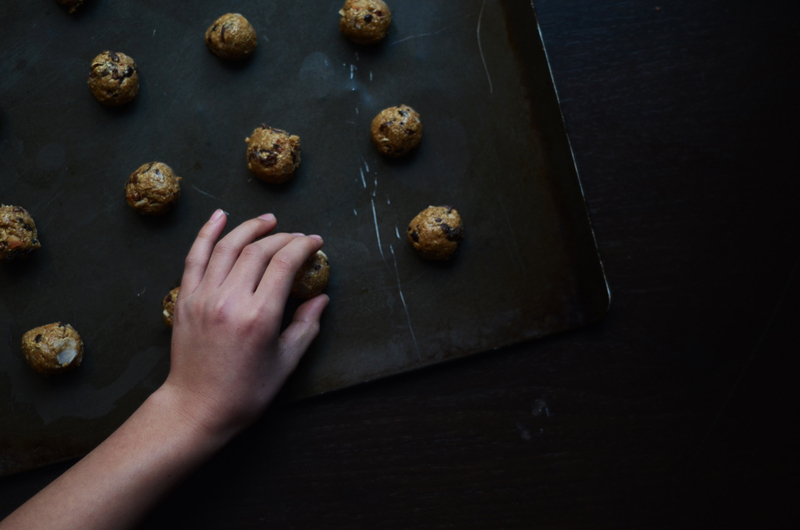 04. take small piece dough, and roll into a ball (be sure to taste test, just to make sure that it's not poison or anything…) and place on a baking sheet. repeat. 06. bake in the oven for 6-8 minutes. i baked mine for 7.